Let me first share with you a little bit about the book, including the cover and blurb, and then I’ll go into what my thoughts are. If you don’t take this note to the police . . . I will kill a lovely blond schoolteacher. . . . If you do . . . I will instead kill an elderly woman active in charity work. You have six hours to decide. The choice is yours. The typewritten note under his windshield seems like just a sick joke. But in less than twenty-four hours, Billy Wiles, an ordinary, hardworking guy, is about to see his life take on the speed of a nightmare. Because a young blond schoolteacher is murdered—and now Billy has another note. And another deadline. This time he knows it’s no joke. He’s racing a killer faster than evil itself. And Billy must accept his terrifying challenge: The choice is yours. Think fast. Fear never slows down. . . .
Sound goods, right? It did to me! And after reading it, I thought that it was amazing. That’s why I rated it four stars! Let me elaborate. 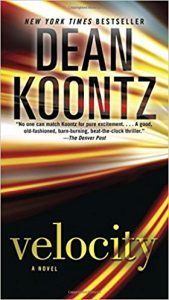 Dean Koontz did a wonderful job describing the story. There was never a dull moment. I thought it all came together rather nicely. Throughout, I was left wondering who could be the culprit. I also think that the whole premise is crazy! With these hard choices, there’s no way I could make a decision. What a creative thinker Mr. Koontz is. I applaud him for that. Some descriptions were too many, in my opinion. I thought there was information we just didn’t need. I felt the ending was too easy. Once we figure out things and the victim works his way to victory, it all just goes too quickly. There was barely a fight. I also didn’t like how the character was too “at ease” with everything. There is no way a person, going through what this character did, would handle it the way he did. But overall, I liked the book. I’m glad my sister recommended it. I would recommend it as well. To warn you, though, it isn’t clean. But that shouldn’t really come as a surprise, seeing as it’s Dean Koontz and all.